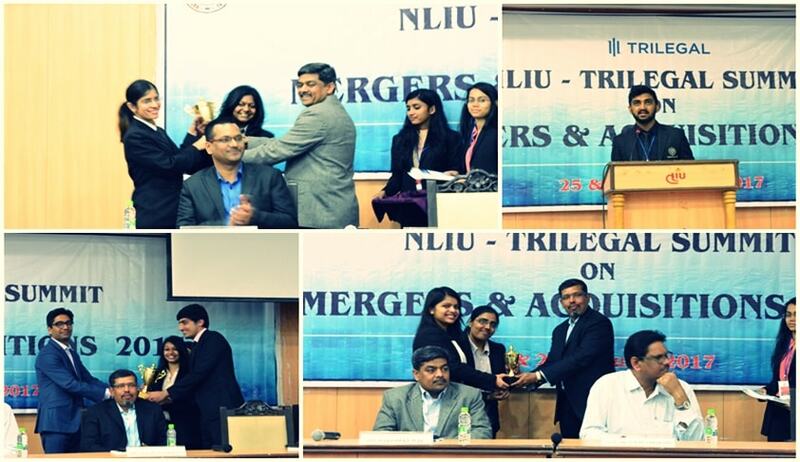 The Centre for Business and Commercial Laws (‘CBCL’) of the National Law Institute University, Bhopal in collaboration with Trilegal, organised the second NLIU-Trilegal Summit on Mergers and Acquisitions on 25thand 26th February 2017. The Summit invited participation from delegates and paper presenters from all across the country. The Panelists in the conference included experts in the field such as Yogesh Singh (Partner, Trilegal Gurgaon), Sitesh Mukherjee (Partner, Trilegal, Delhi), Rakesh Kumar (Joint Director, Competition Commission of India), Nandan Kumar (Joint Director, Competition Competition of India), Krati Rajoria (Associate Professor at Amity Law School), Kritika Agrawal (Expatriate Tax Consultant at Trotman Repp Ltd.).The panelists also included Dr. Sanjay Yadav (Associate Professor NLIU) and Mr. Mahendra Soni (Lecturer at NLIU). The sub-themes of the event were key developments in disputes pertaining to M&A, valuation mismatch & impact on M&A structuring, M&A in Infrastructure Sector. The students linked various issues such as arbitration, banking, finance, taxation and dealt with the nuances of Cross-border mergers and acquisitions. The top 16 submissions were published in an ISBN certified book commemorating the Summit. Additionally, the winners for the article competition were awarded not only a cash prize of Rs.11,000 but also an internship with Trilegal. The winner in the essay writing section was also awarded a cash prize of Rs.11,000. The CCI members found the concept of this summit to be very innovative and commended the brilliant initiative that facilitates student discussion and participation on a large scale. The effort put in by NLIU and the support it received from other colleges was applauded by Yogesh Singh, who also appreciated the depth of the analysis put in by all the participants. Sitesh Mukherjee advised the students to be informed about what is happening in business, finance and politics to gain better understanding of the M&A field because of its all-encompassing nature. A resounding success, this year’s Summit surpassed the previous edition, and has set a benchmark for the editions that will follow.